Few people can drive a theological point home quicker than C.S. Lewis. He does it so smoothly and painlessly that you don’t realize that you’ve been stuck with a barbed Bible for about a week, until you try to pull that thing out of your brain and find it’s imbedded like a popcorn kernel in a tooth. In The Horse and His Boy (one of the Chronicles of Narnia), our hero Shasta outruns a lion into the relative shelter of a hermit’s home. As he struggles to breathe and recover the feeling in his legs, the hermit tells him to run right out the back door and keep running in order to warn the king (read the book if you want the full story, people). But as Shasta starts running, C.S. Lewis drops this: “Shasta had not yet learned that if you do one good deed your reward usually is to be set to do another and harder and better one.” See if that doesn’t get stuck in your brain craw for a while. Esther probably thought something similar in chapter 8. After taking her life into her hands to show up on the king’s doorstep, facing down Haman at high noon, watching her mortal enemy get a hemp necktie (not really, but who could resist that phrase? ), and escaping with her life she probably thought she deserved a good spa treatment and some chai tea. Instead, she once again is forced to go before King Xerxes and plead for the life of her people, this time to reverse a royal decree which (according to Persian legal thinking) could not be reversed because a living god like the king could not be wrong. Let’ s not forget that this is the same Xerxes that once got a gift from a peasant man and was so pleased that he returned the gift with a few million dollars of his own; but the same man asked for one of his sons to be relieved of military duty and Xerxex had the son cut into two pieces so the army could march between them. Not the most stable ruler the world has ever seen. So, Esther comes to her divine and infallible hubby once again, and falls at his feet weeping (notice she didn’t weep the first time, for her own life), asking him to admit his error and save her peeps. Xerxes apparently was impressed enough to give her carte blanche to do whatever she wanted. Atta girl. In any case, our thought for the day is a challenge. Let’s not assume that once we’ve done one thing for God, our duty is done. On the contrary, God probably has something harder coming up next. Our prayers should not be “You’re welcome, God,” but “prepare me, Lord.” It’s not always easy, or fair, at least to our way of thinking, but that’s the way life usually goes. God is always working on us. 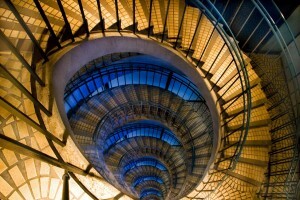 There’s always another step, another opportunity on the horizon, each one harder and better than the one before. That should give us pause as well as hope. Don’t you want a tea now? It’s easy to forget that the folks in the Bible are people just like us modern-acrats. It seems like they are so distant from us in time (and usually in space) that it’s hard to relate. For instance, do sheep and millstones mean much to us today? But they were as common as Mt. Dew and lousy reality TV back in the day. So it’s nice when the Bible reminds us that peeps are peeps, no matter when or where they lived. Take Mr. Xerxes. King of all Persia; he of the ridiculously short fuse and the creative punishments. 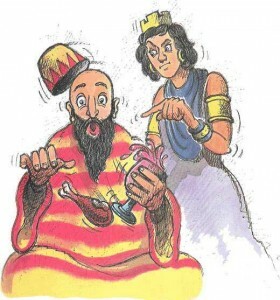 In today’s story, he and his bestest bud Haman are dining with Queen Esther for the second time, and this time Esther drops the matzo bomb on him: his wisest of wise men, Haman, is really a genocidal spazweasel. We can all agree that Xerxes actually shows remarkable restraint at the news. He doesn’t smack Haman in the noggin or even arrest him. Instead, he goes out to get some fresh air and ponder this new set of circumstances. As we’ve seen in the past, Xerxes is not known for reasonable discourse, so we should give him his props in this instance. Meanwhile, Haman realizes he’s into it up to his chinny chin chin,and he’s got only one chance: beg Esther, the Jewish Queen, to have mercy on him. Wouldn’t you know it, in his haste to get to the begging, he trips and falls right into Esther’s lap right at the time when the king comes back. YOU LOOKING AT MY BIRD? This is when Xerxes shows he’s as red blooded as a Texas cowboy. He was ok with the planned annihilation of a good portion of his populace, and even with the slightly less obvious implication that his trusted adviser deliberately kept him in the dark regarding the full details of his plan. But what he won’t stand for is someone messing with his lady. The king comes in, sees Haman apparently in the act of trying to get his groove on, and his self-restraint flies away like a hotdog wrapper at the ball park. He immediately orders Haman’s execution (on his personal gallows, no less), the guards march him out, and the fall of Haman is brought to completion. Now we come to the crucial part: How do we make a spiritual application out of this Days of Our Lives episode? Just this: God’s plan can happen in an instant. One minute Haman was planning his retribution against Mordecai, counting his imminent wealth and power, and reveling in the halls of the powerful. But with one sentence from Esther (under God’s guidance, of course), the world was turned around. Once again we are reminded, as so often in the book of Esther, that when God’s plan is in motion, it’s unstoppable. It’s a tricky thing living in the most prosperous country in the world. There’s an almost unavoidable tendency to put our trust in things rather than God. How much time do we spend planning our retirement or career path? How does it compare with the time we invest in God’s Word? Haman found out just how slippery the things of the world are, and how quickly they can be taken away. He spent all his time pinning medals on his tunic and getting the latest turban instead of trying to help others.Haman put all his trust into his own position and authority, and when th at was gone (or actually just threatened), he had nothing else on which to rely. Even his friends and wife told him he had nothing left to live for. Back in the 1929 stock market crash, hundreds and thousands of businesses went under, and there’s a running visual joke in Hollywood about despondent bank owners and whatnot hurling themselves from office windows. In actuality, the problem wasn’t a lack of money, and many of the people who held on came out ok in the end. What the pavement divers lost was hope. If your hope is in money (or employment, or education), sooner or later it will fail you. 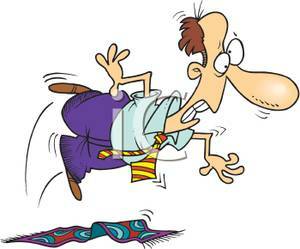 What will happen when the rug is pulled out from under you? This doesn’t mean that money, or education, or possessions, or retirement plans, or anything of the sort is wrong. It is perfectly Biblical to be wise with our money. The problem is when our hope is in our possessions instead of the Provider. Corrie Ten Boom used to say that one of the secrets to living for God was to “hold loosely to the things of the world.” Notice that it’s not necessarily wrong to hold worldly things, we just need to hold them loosely so we don’t end up trusting them instead of God. For Haman, what would have happened if he would have gone to the king and said, “I made a mistake; you have honored a Jew today, and we should honor the Jews throughout the empire tomorrow.” Esther may have abandoned her plan, the Jews would have been saved, Mordecai would have been elevated, and Haman may either have stayed as the king’s top adviser or at least remained in the inner circle. Instead, he clung desperately to the only thing he knew, and he lived just long enough to see all of it taken away. Our prayer today is that we will cling to God and hold loosely to everything else.